Approbation | Диагностический комплекс "Кристалл"
Approbation of the "Crystal" technique was made at the Department of psychology of the International institute of psychology and management in St.-Petersburg in March, 2004. During the approbation high validity and reliability of the method has been proven. The results of this examination were fully confirmed by modern methods of psycho-diagnostics. Since 2005 the technique is used for solving research and development problems on a continuing basis at the Department of Psychology-pedagogical Technologies of Health Protection and Strengthening of the Federal State Educational Institution, the Academy of Teachers’ Training and Professional Retraining, at the Ministry of Education and Science of the Russian Federation (Moscow). 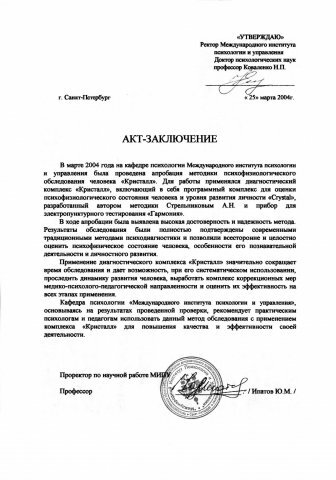 In September, 2006 the testing of employees of the public corporation «Mechanical Engineering of Severnaya Verf» (Mechanical Engineering of Northern shipyard ) (St.-Petersburg) was made for the purpose of revealing the possibility of application of the “Crystal” method for solving analytical, statistical and personnel problems of the enterprise. 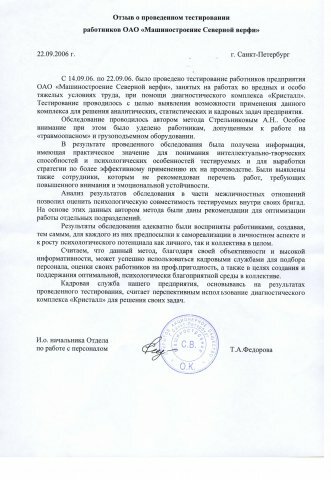 Within the program “The Development of New Methods of Preventing Children and Teenagers from Using Psycho-active Substances” the pupils of school №187 has been examined with this method in May, 2005. 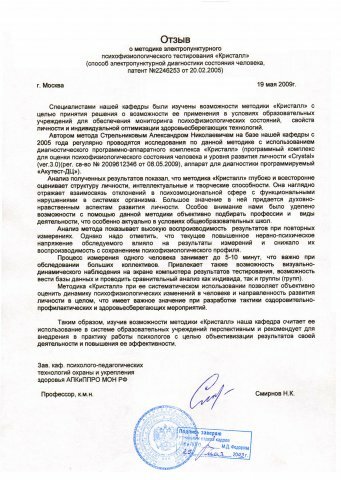 The report about computer diagnostics of pupils’ health at school № 266, Moscow, in April, 2003, 19 pp. In April, 2003 the technique was used in school №266 (Moscow) within the program of the Inter-regional social fund «Renewal of Children's Health». The report to the Ministry of Labour and social development of the Russian Federation, June, 2003, 54 p. and June, 2004, 56 p.
From 2003 till 2004 in the All-Russian centre "Orlyonok" within the Ministry program «Health for schoolchildren» children requiring special care of the government were examined with the "Crystal” method. The following work was awarded with the diploma of the Department of Education.